Consider seeds for a head start on spring. Starting flowers, vegetables and herbs can save you money, and give you a lot of satisfaction. Another bonus is having a greater choice of species and varieties. Instead of a garden center petunia mix, you can choose the precise color or form you prefer. You can try more fragrant varieties of favorite annuals such as nicotiana or grow less well-known plants, such as airy Brazilian verbena (Verbena bonariensis) or firecracker vine (Mina lobata). You can start perennials that may not be available at your local garden centre, and when it comes to vegetables and herbs, you can find more flavorful varieties that put supermarket produce to shame. Starting your own plants isn’t too difficult once you get the basic techniques down. Most packets have growing information printed on the back. In general, annuals and vegetables germinate quickly and are easy to grow, so if you are just getting started, these are your best bet. Annuals tend to germinate at temperatures between 64 to 70F (18 to 21C), but many perennials need cold treatment to break dormancy. In the real world outside, they lie on the ground all winter and then sprout when the weather warms in spring. 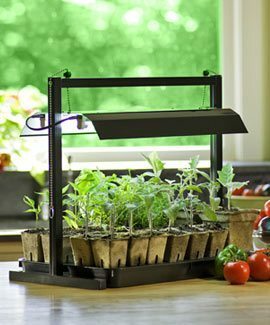 You can mimic this in the refrigerator or outside in a cold frame. See more information on getting organized, timing and how much to sow. For sowing, use a commercial starting medium (a mix of peat, perlite and vermiculite, such as Pro-Mix). Moisten it an hour or so before sowing. It should not be soggy – aim for the moisture of a wrung-out sponge. As general rule, sow seeds about as far below the growing mix as they are large. Big ones generally should be covered with growing mix, and tiny ones barely need to be covered. If light is needed for germination, do not cover them at all – just press them into the growing mix. 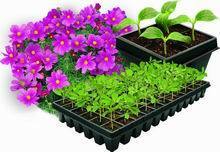 Give all trays or pots a light watering and cover with a plastic dome lid or seal the container inside a plastic bag. Newly sprouted seedlings tend to look alike, so be sure to label containers as you sow. Small ones can be tricky. A simple solution is fold a piece of paper and then pour the contents of your packet into the fold and tap the end of the paper lightly so that the contents can slide off onto your germination mix. If they still stick, sprinkle them with a bit of baby powder to reduce static cling. As soon as you notice germination, remove the plastic dome or plastic bag. Make sure seedlings have plenty of light. Grow lights are ideal.